Supplementary material reads: "From News Bureau. Pan American World Airways. Caption and Story. 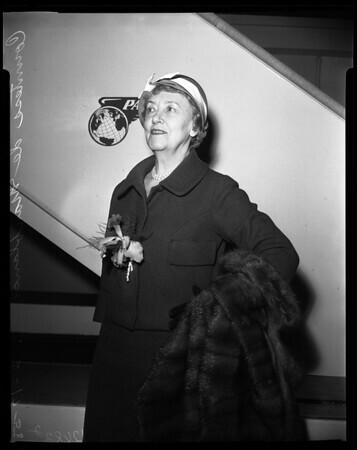 Countess de Maublanc, sister of the famed Elizabeth Arden and president of the Arden Cosmetic Company in France, arrived in Los Angeles via Pan American Airways Polar Route on her first trip to the West Coast last night (2/16) and will remain in the city for approximately six weeks. However, some of the time will be spent following the races at Santa Anita. The wealthy influential French socialite will be particularly interested in her sister's horse, 'Alibi' running at the track March 1. 'Yes, I read 'the sheet' quite a bit', she said. She also stated that, 'Women in Europe like women in the United States are not accepting the so-called new sack look and we'll be seeing less of it as time goes on'. During her visit here she will stay with her son and daughter-in-law, Mr. and Mrs. John Graham, 632 Ocampo Dr., Pacific Palisades. He is the Pacific Coast Sales Manger for the Arden Company here."